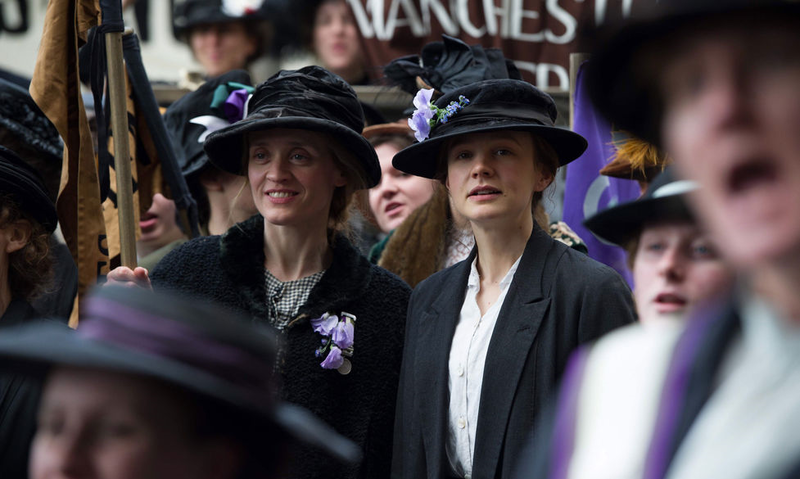 Carey Mulligan scores another point for feminism on film with Suffragette. The film offers a hearty follow-up punch to Mulligan’s spectacular performance as a Bathsheba Everdene with contemporary sensibilities in Far from the Madding Crowd, and Suffragette affords another strong role while paying tribute to women who turned the tide for women’s rights in England. The film tells the story of a specific group of women involved in the suffragette movement, particularly those taking up the cause under the guidance of Emmeline Pankhurst (played by Meryl Streep), whose radical advice of “deeds, not words” throws the suffragettes into a fight. Maud (Mulligan) finds herself at the front lines of the battle when a co-worker at her laundry mill (Anne-Marie Duff) inspires her to stand up for her rights. Through Maud’s reluctant awakening to the movement demanding votes for women, Suffragette shows the power that one individual has to change the world. Why Suffragette opts for Maud’s story, however, becomes muddled as the film reaches its climactic conclusion and Maud sees a fellow suffragette do an act that gives the movement ample exposure. The film ultimately stresses the significance of Nathalie Press’s character Emily Wilding Davidson. Why Suffragette doesn’t just tell Davidson’s story is an odd choice, since the film offers an endnote that privileges her story over those of the other women. It’s not a fatal post-script, but rather an awkward one comparable to the photo of a Spanish Belon family in The Impossible that reframes the all-white actors who portray them in the Spanish film. Mulligan nevertheless gives a very strong performance as she wears Maud’s fatigue with “the way things are” with a composure that melts from pacifism to anger. Abi Morgan’s script treads preachiness, but as one watches Maud transform under Mulligan’s care, the film shows an ideological awakening: once one sees things as they are, one cannot go back. In the spirit of the film, though, Suffragette stands with the united power of the women championing the fight. The ensemble is strong overall with Helena Bonham Carter and Press joining the ranks as fellow suffragettes, while Streep’s pivotal cameo as Pankhurst is a spot on bit of casting that uses the actress’s power and persona to create a larger than life figure who speaks with compellingly charismatic authority. See Suffragette to admire its performances and to help cast a vote for more films by and about women. Every ticket is a ballot! Suffragette is now playing in theatres. 45 Years is filmmaking in the barest and best sense. Driven simply by a provocative premise and two wonderful performances, 45 Years beautifully envelops the viewer in an understated story of love and the challenges it faces over the years. 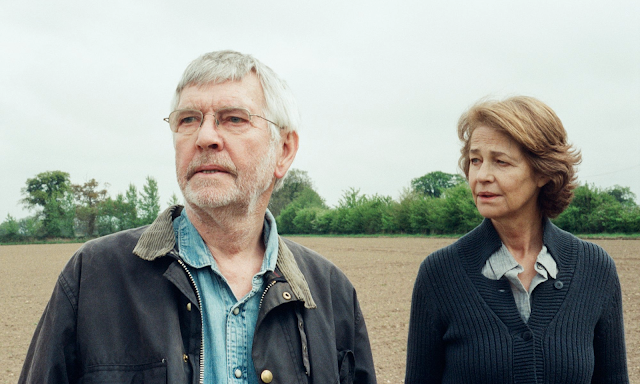 Charlotte Rampling and Tom Courtenay star as Kate and Geoff Mercer, a married couple in the midst of the golden years of marriage. Preparations are underway for a large fête in celebration of their forty-fifth wedding anniversary, but Kate worries that the past forty-five years were all a lie. The sad twist comes when Geoff receives a letter about a woman he loved years before he met Kate. As Geoff slips into his rose-coloured remembrance of the past, life takes a bitter hue for Kate as she reframes their marriage and wonders if she’s simply been a placebo all these years. 45 Years plays out this tense lingering conflict over the week that precedes the anniversary party. Each day, marked by a title card, brings a bittersweet twist as Kate and Geoff mesh like a potion mixed with the perfect chemistry, yet lingering doubts pollute their harmony as more revelations from the past surface with poignant consequences. Haigh plays out this drama like any fight a couple could encounter over the course of a lengthy marriage. Every notes arises naturally and evenly—don’t expect heightened shouts or smashed plates in 45 Years—and he uses one crucial grain of truth to invite the audience to invade the intimate space this couple occupies. Rampling and Courtenay have never been better as they play their roles with seasoned unstated grace. Their rapport speaks volumes of their experience as actors with an eye for subtly conveying the complexities of love. Rampling is especially good—and 45 Years affords her the showier role with its construction—in two key scenes that let the silent power of her face, wrinkles and all, inform the viewer with its jarring emotional language. One scene lets Kate revisit an archive of Geoff’s former flame. As Kate watches images on a slideshow, Haigh simply trains the camera on Rampling’s face and lets the audience witness Kate’s reactions to the images that on the screen (which we can’t properly see). As the wheel of the projector turns with each click, 45 Years lets the audience examine Rampling’s eyes for clues as Kate quickly scans the pictures. It’s a powerful scene, as each picture tells a story as Kate looks for hints that Geoff’s love is a betrayal. Rampling offers the same devastating silent power in the film’s final scene as Kate takes Geoff in her embrace and weighs the dance of their 45 years together. Love rarely seems so wonderful—and so cruel—as it does in each bittersweet frame of 45 Years. 45 Years opens in limited release in Canada on January 22, 2016. 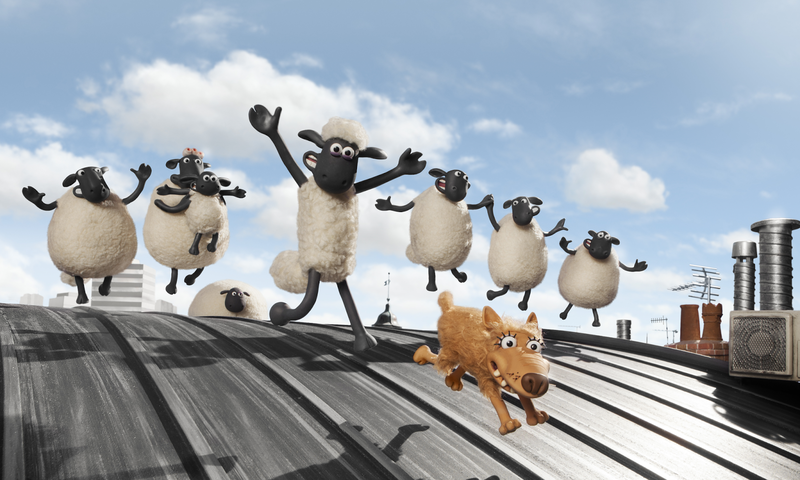 What a fun adventure Shaun the Sheep Movie is! The film adapts the popular TV series from the creators of Wallace and Gromit, and it delivers the same enjoyable stop-motion animation that brings out the kid in all of us. Shaun the Sheep Movie is especially notable for its ability to elicit laughs and good cheer without uttering a single word, for the larks of these barnyard animals led by Shaun the sheep communicate solely through gestures, expressions, and the occasional barnyard noise. Shaun herds the animals on a barnyard rebellion, which eventually takes the flock into The Big City in search of their farmer, who isn’t as bad as he originally seems once the animals eject him from the farm. The loony, free-spirited animation is funky, warm, and consistently appealing—it’s refreshing how much more life an animated film has when it doesn’t look like a computer program—and the film pays as much attention to story and character as it does to the visuals. It’s a funny, madcap caper. Also noteworthy: The Danish Girl and Phoenix hold up to repeat viewings!